As a hand letterer and logo designer it often hurts my eyes to see how many record companies didn’t care for the design of their products. And not only the record companies did a poor job when it comes to design, almost every product made after 1964 lacks the quality that was a norm in the fifties. 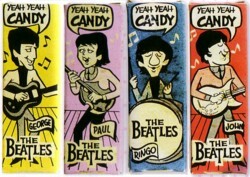 Something went wrong in the mid-sixties. 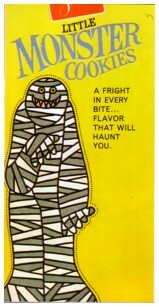 Before that, most of the design was beautiful, or at least had some charm. But 90% of the sleeves of records made after 1964 are not worth hanging on the wall, except for nostalgic reasons. 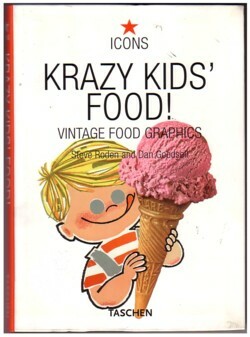 I have a Taschen book lying in front of me, Krazy Kids Food. 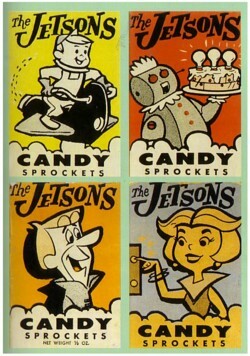 It is a selection of graphic designs for candy and food products, collected by Steve Roden and Dan Goodsell. All illustrations you see here, except for the record sleeve, are from that book. The beauty of this stuff makes my heart jump for joy. My own style of lettering and logo design is rooted in this fifties cartoon world, but I have never made anything that comes near to the examples shown in this Taschen book. The combination of hand work, craftsmanship and naivety, that people had in those days, is gone forever. If there are any records in my collection that have designs like the ones shown in Krazy Kids Food, it are records on my advertisement shelf. But not much. Here is an example: a one-sided flexi record made to promote built-it-yourself furniture. 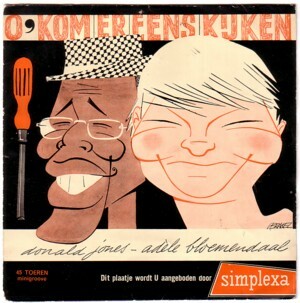 The company was Simplexa and the artist were Donald Jones and Adele Bloemendaal. They were a married couple in real life and he was one of the first black people who made a career in Dutch entertainment. He was a jazz singer, but played roles in several television series too. Adele was a popular comedian and a great singer. She is still alive, but not active on stage anymore. On one of her LP’s she sings a very controversial song about necrophilia, which was not a popular subject in Holland in the seventies. The Simplalux-song is not controversial, but it is today’s soundtrack.